Founded in 1965, the Freedom Historical Society acquired the Allard House by the generous bequest of Margie Allard in 1977. Built by volunteers in 1981, the Works Barn houses a collection of farm tools, machinery and vehicles in use before electricity or gasoline engines. Photographs, portraits, maps and posters are displayed in the meeting room which also has a growing lending library. In the Allard House you can see Freedom memorabilia, mostly items donated by local residents. The furnishings generally reflect the late nineteenth century, when most of the village houses were built. Here you will find an Estey parlor organ, period costumes, a tiny doll house, a surveyor’s compass, photographs, books, and many other unique items. Click here to view a full list of the collections. 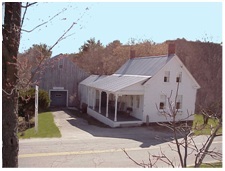 As you face the property at 28 Old Portland Road, on right is the Allard House, bequeathed in 1977 by Margie Allard to the Freedom Historical Society, and so deeded at her death in 1979. In the rear is the Works Barn and Meeting Room, named for Nelson (Skrow) and Glad Works who began the museum collection of pieces of Freedom’s history. Their portraits by Peg Scully hang in the barn meeting house. Much of our town’s history is not only “stored” and “exhibited” within both structures, but plenty of good tales are related to the property: some are speculation and others are documented facts. It might have been a dark and stormy night in 1828 when Luther Harmon of Effingham conveyed to Captain Zebulon Pease, also of Effingham, the deed to 1 ½ acres of land at this spot for $75.00. 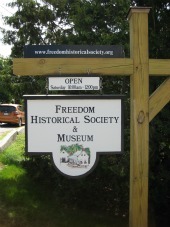 What is important to know is that “Freedom” did not become the name of the town until 1832. Prior to that, the area was part of Effingham, Strafford County, and known as “North Effingham” when the townspeople broke “free” in 1831. The next year the people of this town voted to change the name to Freedom, signifying ‘freedom from Effingham’ (according to some stories). The state legislature enacted this change under the leadership of a future American president: Franklin Pierce. That said, a deed of July 1840 states that a blacksmith exists on the property (a few rods to the left of the granite markers alongside the driveway…on today’s next door neighbor’s land) at the time, and it makes sense that a house was built at the same time or before the shop. Cyrus Fowler was a blacksmith and “leased” the shop and possibly house prior to owning the property. This was common practice in old Freedom. Fowler was deeded 1/3 acre of land for $50.00 in 1842 from Zebulon Pease. In 1846 Fowler bought another 20 square rods of the land for $35.00. In 1860 Cyrus Fowler was living in the house. Just after the Civil War years, in 1868, the property is owned by another Pease: tailor Alonzo Pease. His shop was quartered above the E.I.Towle & Co. store that once stood at the northwest end of Old Portland Road, on the corner. A photo from 1890 shows the building with a sign advertising Pease’s shop. The house changed hands a few times according to legal conveyance records but the most colorful part of the narrative comes when, in 1943, George and Marguerite Allard took possession. George was a well liked Freedomite who assumed various jobs about town. He raised and lowered the flag up in the square. He oversaw activities at the town dump for many years. When he purchased the house he was working at the Portland, ME Navy Yard. He was a Mason and a familiar character, going about his business in all weather. Margie established in her home ‘Margie’s Lunch’, a fixture in the village. Seating was on the porch which was enclosed with the door on the end facing the road, where the split stone step is next to the hitching post. The door from the porch into the ell, facing the road, led into a dining room, then into the kitchen. Tables were put along the drive edge of the porch, with passage along the house side. The Masons would stroll over to Margie’s for coffee and dessert after business meetings were finished up on Schoolhouse Hill. During several years, children from the school would cross over to Margie’s for their hot lunches. The little garden at the side of the rear part of the porch includes a climbing rose bush that is a descendant of the flowering plant pictured in the late 1800’s at the East Freedom post office in Carol Foord’s book on Ossipee riverlands. The granite posts along the east side of the driveway mark the edge of the Range Line. The wheel to the left of the sliding barn door is like ones used to “roll” , compress, the snows of Freedom in wintertime. At the back of the property is the old toll booth from Loon Lake Road as well as another shed-like structure that houses old carriages including a fine surrey carriage that once made its annual appearance in the Old Home Week Parade. Down by Cold Brook, the stony outline of the old Moulton-Alexander tannery foundations can be seen.